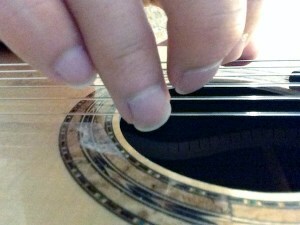 I have always played with my fingers -- flat picks confound me, finger picks feel clumsy. I like direct contact with the strings, with just a tiny bit of finger nail to bring out the highs. The problem has always been keeping them from wearing away or breaking. So a few months ago I bit the bullet: I walked into the beauty salon of my local shopping center and presented my three picking fingers to a bleach-blond named Susan and told her I wanted them done. She didn't want to, but she did them anyway and I walked out ten minutes later with nails strong enough to adjust the truss rod in my Strat. Susan suggested I buy the kit off her (just to keep me from coming back, I'm sure) and so I did. A primer, a liquid which I think is acetone and a white powder. The primer goes on first, then you dip a little brush first into the liquid then into the powder which turns gluggy on the brush. You dab that onto the nail let it dry and presto - nails like steel. You can then file them and shape them as you please. Life has been grand since I discovered acrylic nails. I can dig in all night and not even scratch them. If you rely on your nails like I do to get your sound, go for it. If you're still looking for a way of navigating the fretboard that has nothing to do with scales or notation or TAB, come visit my site, read about the 'trick'. There's a drop-D tuning slide guitar lesson there too. His left hand, which frets the guitar, has very short nails, except for the "pinkie" and thumb nail which are not used for playing. His right hand, however, is the more particular in that it is the one that creates the crisp, clear sound that is necessary against the nylon strings. The nails cannot be too short or long, for that matter, and must have a perfect roundness with absolutely no "corners" at the cuticle. The pinkie, again, is not as important as the others, while the right thumb nail is most crucial to his performance. It is a bit longer than the rest on that hand, and again, is perfectly round and very strong. God certainly blessed him there. One supposes the stimulation to his hands has helped his circulation, too, over the years---why, after all, are one's toenails stronger than the nails of the hand??? The length, shape and surface of your fingernails have a direct effect on your playing: how you care for your nails will affect your music as much as how you practice. A short, well-shaped, smooth-edged nail will facilitate fingerstroke and produce a clear tone; a neglected nail will interfere with right hand efficiency and will sound raspy. Differences between individual nails will disrupt right hand technique even further, particularly in alternation and arpeggios. For the developing student, this can cause a great deal of wasted practice and frustration. Finally, regular and proper care of your nails is the single, foremost way to prevent them from breaking and requiring repair. After you're finished, visually inspect each nail for consistency in length and shape. Use the thumbnail edge to feel each fingernail edge for flaws in smoothness and shape. If your nails are properly shaped with the edges finely polished, there should be a distinct increase in ease of execution, and also in tone quality. One policy that may help is to rub skin-cream or nail cream into the cuticles of the nail, twice a day. This will strengthen the nails in a general way and make them more resistant to damage. Avoid getting your nails wet. Use rubber gloves when you have to wash dishes, the car, etc. Get into the habit of using your left hand for things such as opening doors/drawers, flicking switches, anything where you might catch the nails on something. Let your left thumbnail grow a little long so you can use it for prying instead of the right one. Keep the nail edge very smooth with a file and ultra fine sand paper (around 600 grit). This will prevent little snags which can catch on things and maybe rip off the nail tip. Apply two or three layers of clear nail polish. Put polish on the overhanging underside of the nail too. Don't let the nails get too long. They can hamper your playing and they may break easier. Can I repair a partially broken nail? Yes, but it isn't altogether a good idea or stunningly easy. Prevention is better than cure (cf. A2.2). However, for some people, such as performers, a damaged or split nail must be repaired. Get some superglue and use this to put the nail back together and in place. Do I need to say be careful? Why not. BE CAREFUL. Alternatively, or in addition, buy a little pack which is designed for this purpose - I believe they sell them in pharmacies. They consist of little bits of tissue paper strengthened by fibers and a bottle of nail varnish. Follow the instructions on the box, but basically its a case of pre-wet the tissue with nail varnish, place it on the wounded nail and then apply several more coats of nail varnish. Leave to dry.